Published in the South Kent Gazette, 11 June, 1980. “For every ship, vessel, or crayer, where of any of the Queen’s subjects shall be the owners or part owners, of the burden of 20 tons and upwards, loading or discharging within the realm, and passing to and fro any foreign country during eight years, there shall be paid for such voyage, by the masters or owners of such ships, etc., three pence for every ton burden, except ships laden with sea coals or grindstones, towards the repair of Dover haven, and for every chauldron of sea coals, and for every grindstone, three half pence.“ There seems to have been some doubt whether the granting of these tolls did not annul the monopoly of export previously granted, therefore, to dispel all doubt, the Queen, the next year, renewed the charter, extending the right of the corporation to export, free of duty, from any port of the kingdom. At the same time, benevolences from City Companies, taxes on alehouses, and collections in churches were also authorised, as means of raising money for the harbour. The money raised by these means warranted the commencement of large works. 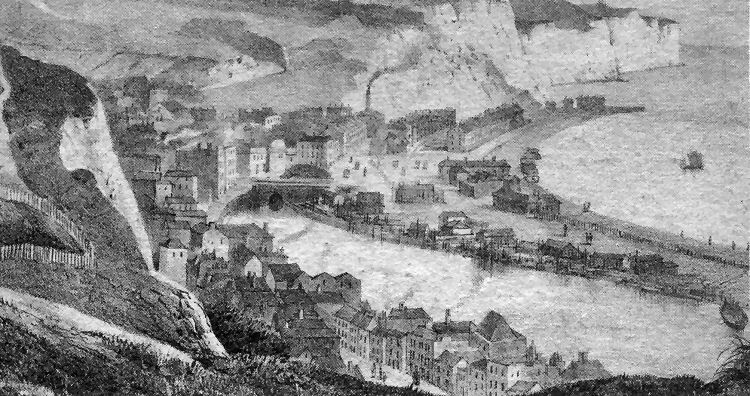 Sea walls, estimated to cost £7,000, were undertaken, a Board of Royal Commissioners .being appointed to superintend, consisting of Lord Cob-ham (the Warden), Sir Thomas Scott, Sir James Hales, Thomas Wootton, Edward Boys, Richard Barrey, William Partrich, Henry Palmer, Thomas Digges and the Mayor of Dover. There were various plans submitted by confident engineers; but the one adopted was very simple, being a scheme for utilising the great pool of standing water, by building walls beside it and across it, and rising the impounded water of the upper part to wash out the obstructions from the lower. With Mr Thomas Digges as engineer, and Sir Thomas Stott as superintendent, a bold effort was commenced to transform the great shelf of beach, fronting the town, into a wall sufficiently substantial to hold water, and resist the assaults of the sea. This was proposed at first to be constructed of stone, but, that being far too expensive, the embankment was eventually made of mud, chalk and faggots, pinned down with piles. This embankment, which was called the long wall, was completed from the water gate, near the bottom of Townwall Street, to near the present harbour mouth. 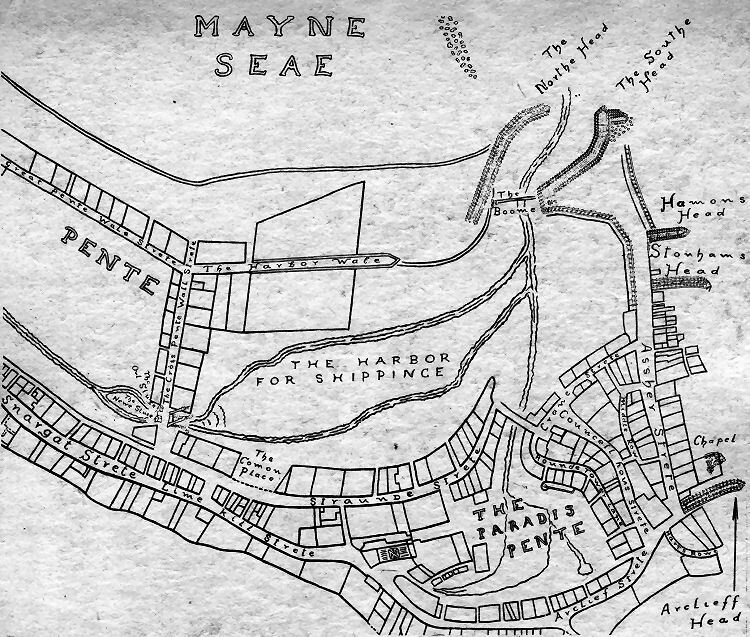 The pier district and the western docks area as it appeared 340 years ago. The map, with its quaintly spelt names, was the labour of love of an old gunner, William Eldred, who served at Dover Castle for 60 years. He was 78 when he wrote, in 1641, a dedication, accompanying the map, addressed to the Duke of Richmond and “the rest of the honerable the Commissioners of Dover Harbor.“ Apart from the map he drew up a list of the owners and occupiers of land and buildings and listed the measurements of properties. The map shows clearly the site of the old Paradise Pent and some of the early sea defence works which were intended to halt the choking up of the harbour mouth. The Great Pent, now the Wellington Dock, on the left, was listed as spanning 16 acres. The “Cross Pente Wall Strete“ is what we now call Union Street. On the extreme right Assher Strete, running parallel with the shore, was subsequently renamed Fisherman’s Bow but until recent years, when all the property there was demolished, it was better known as Seven Star Street. The chapel by Archcliff groyne is that of our Lady of Pity, said by one historian to have been swept away by the sea in 1576. An interesting print, dating from about 1825, depicting the view from the cliffs above Snargate Street over the Great Pent and looking towards New Bridge.